60 Capsules New Pure Yacon Raw Root Extract Weight Loss All Natural Made in USA Pure 1000mg,What is Yacon Root Extract/Syrup? The Yacon Plant (Smallanthus Sonchifolius) is a perennial plant grown in the Northern and Central Andes from Colombia to Northern Argentina. Yacon Root contains naturally occurring Fructooligosaccharide (FOS), and has been traditionally valued for its prebiotic and probiotic support. It also acts a metabolism booster and dietary supplement. We made sure our formula exceeded th recommendations of a popular daytime talk show Doctor. We decided to dismiss the syrup and put 100% All Natural Yacon Root Extract straight into a capsule. This helps keep the cost low and makes the product easier to take. With our capsule formula, you do not need to make a cup of tea to put the syrup in, just take 1 pill 2 times a day with a glass of water. Our product is made right here in the USA in a GMP certified facility so the strict regulations make sure you are getting exactly what is listed on the product. Our product is extremely easy to take. When used as a weight loss supplement, just take 1 pill with a glass of water 30 minutes before each meal. You can do this 2 times daily. Since our extract is in capsule form, you do not need to make a cup of tea to put this in like the syrup form. You will also not have to worry about the bitter taste of it. Results should show for most within the first 4 weeks. 5-7lbs of weight loss should be expected every 4 weeks. We recommend taking the supplement for at least 8 weeks to achieve premium results. 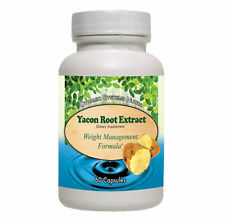 27 (68%) recommended Yacon as a weight loss tool.